There are three means of conducting bank business: analog, digital and automated. Analog banking involves the slow and inefficient use of pens/pencils, paper and filing cabinets, a system that is extremely vulnerable to mistakes, errors and duplication. Digital banking is a step more advanced and includes the use of spreadsheets, email, hard drives and servers. But, while the tools and systems used are digital, data input and multi-platform synchronization is still done manually. Robotic process automation eliminates tremendous sums of manual process because software programs perform the bulk sum of a bank department's activity. Process automation streamlines bank processes to a refined system, reduces employee workload exponentially, saves time and money, and assures compliance with state, federal and international regulations. But, it is generally best not to make a transformation in its entirety in a single development phase. There are two benefits of phasing in robotic process automation. Process automation transformation can be complicated. While the IT architecture transformation is not particularly daunting, on the other hand, the transformation to process automation requires employees to upgrade their skill set in order to take full advantage of the tools and capabilities of a process automation system. To minimize the necessity of a steep employee learning curve, banks can implement process automation software in phases in order to allow employees to master on process prior to moving on to another. 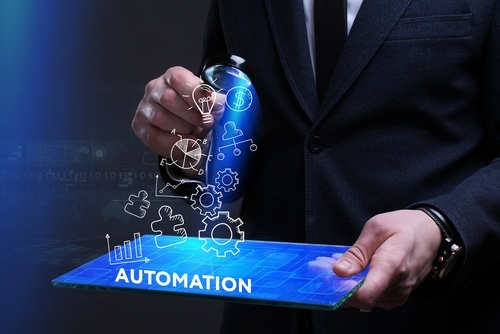 Phasing in process automation allows employees to adjust to a non-analog system, and the costs of a robotic process automation transformation can be spread out over several months. If a bank chooses to make a process automation transformation one department — or process — at a time, the bank must first decide which process will be easiest to automate and which automated process will generate the most savings through the reduction of labor costs. There are three things to consider prior to determining what processes to automate first. Time-consuming, menial processes are typically the simplest to automate and generate the greatest return on investment (ROI). By minimizing the number of remedial processes first, the bank can concentrate the efforts of its employees on tasks of greater importance and complexity. Another inefficient and costly process that affects almost every department in a bank is cross-platform migration. Moving data from one platform to another manually — because the two software programs or systems are incompatible — is another relatively simple and cost-beneficial process automation priority. The bank's IT department is capable of maintaining, troubleshooting and upgrading the robotic process automation. The IT department is capable of developing robotic process automation software. If a bank's IT department is not capable of developing robotic process automation software, automating the process will require assistance from an outside source. During development of the bank's process automation, the bank's IT department should work hand-in-hand with developers in order to assure that they are capable of maintaining, troubleshooting and upgrading the robotic process automation software once development is complete. While every bank is different and there is not a universal formula for determining which processes to automate first, there are a few general bank processes that are typically ideal for automating in the first stages of a process automation transformation. Data Management — Enterprise-wide data governance, entry and storage standards, data accessibility, etc. Client Onboarding — Gathering personal information, opening an account, reviewing mortgage applications, wealth management/trusts, etc. Relationship Management — Account customer requests, customized & sophisticated service delivery, consultation, collaboration, process time-requisite reduction, etc. Online and Mobile Enrollment — With traditional analog and digital bank systems, enrollment is often the most time-consuming process customers and bank employees must endure with respect to a checking account. Online and mobile enrollment reduce the time required to just a few minutes. Check Processing — Automated check processing eliminates one of the most time-consuming and menial tasks of bank employees. Automated check processing not only deducts or adds the appropriate sum to a personal or business account, it updates the system so both bank employees and customers can see their account balance in real time. Remittance Processing — Archiving bank records does not interrupt the daily routine of bank employees and can dramatically increase the space in a bank by eliminating the need for hard-copy paperwork. Equally as important, automated remittance processing gives employees immediate access to archived bank records from their desktop. Digital Mailroom — By transforming incoming documents into actionable data, a digital mailroom eliminates the need to process documentation manually. Sanctioned Screening — For more complex bank procedures like loan and mortgage applications, sanctioned screening reviews an applicant qualifications quickly to determine whether or not the candidate is eligible for consideration. Again, each bank is different and must decide for itself which processes and departments to automate first, but there are a few that automation can change for the better overnight.